Building and living with nature - that is our principle.We advise on residential building biology and ecological issues, if you plan towards a new or if you want to renovate your home guided by health and ecological principles. Our entire product range is based on ecological criteria and strictly tested for harmful substances. Synthetic products do not create a healthy home, you may think of exposure to different toxins for decades, structural damage and mould due to various vapor-impermeable materials in insulation, wall and floor coverings, which are permanently burdening our health. Healthbuild is pointing to health risks and contributes to avoid them. The full declaration of ingredients of our chosen partners and high profile producers is crucial for this task. www.auro.com Since 1983, Auro acts as the pioneer of the natural paint branch and has been successfully expanding its market presence since then. Certified products, developed by specialized technicians, meet highest technical standards for all fields of application, e.g. construction, renovation, care and maintenance. www.dormiente.com has been producing natural mattresses, futons, solid wooden beds as well as duvets, pillows, slats and other bedding products in Germany since 1988. From the beginning their focus has firmly been on health, orthopaedics, ecology and sustainability. With a rigid view on the avoidance of indoor pollutants, they are among the leaders in this very specialized market of consistently natural mattress manufacturers. www.biologa.de Biologa produce effective products that protect you and your family against the effects of electrosmog (electric & magnetic fields and electromagnetic radiation). Solutions for preventive protection have been successfully implemented, a thousand times over, by leading building biologists - Biologa offers tested products that bring about a measurable reduction in amounts of electrosmog. 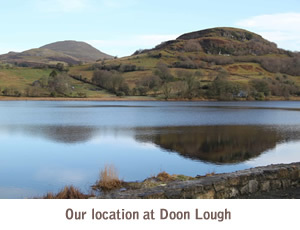 Wilhelm Bodewigs, Doon Lough/North Leitrim, founder of Healthbuild in 1988, certified trainer in carpentry, graduate engineer in urban planning, member of the German association of Town Planning SRL. Today he is advisor on residential building health and coordinator/owner of Healthbuild Ltd.
Our AURO network of experienced traders and craft services: Please have a look at the “Stockists” page in the AURO section. Our presentation of the dormiente mattresses/test displays: Please look at the dormiente page. Beyond our existing two places in Sligo and Macroom: we hope to have a new mattress showroom in the heart of Dublin in May 2011.